A DONEGAL company is leading the way in a new apprenticeship scheme for people who want to work in the insurance industry. Cavanagh Hooper Dolan Insurances, part of the Hooper Dolan Group, has announced plans to hire an insurance apprentice at its office in Letterkenny. The apprenticeship is part of a new Government-approved nationwide programme that, for the first time, allows participants to work towards an honours degree while earning a salary. Cavanagh Hooper Dolan's Letterkenny office at Rossview Business Park, is one of six branches in the Hooper Dolan Group that has committed to taking on apprentices under the Insurance Practitioner Apprenticeship programme. 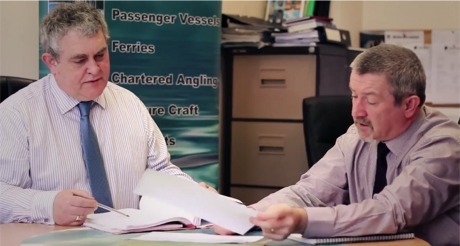 Cavanagh Hooper Dolan managing director Charles Cavanagh, left, is spearheading new insurance apprenticeship in Donegal. 100 places are available in various insurance organisations across the country for 2016, with this number expected to grow next year. The programme is structured around on-and-off-the-job training, with apprentices working as paid employees in insurance brokers or companies, learning valuable workplace skills while also studying towards a BA (Hons) in Insurance online. Managing director of Cavanagh Hooper Dolan Insurances, Inishowen man Charles Cavanagh, welcomed the new scheme. “This programme is exactly what the insurance industry needs to address skills gaps and attract dynamic new talent into the sector,” he said. “We’re looking for enthusiastic school leavers, graduates or career changers who are eager to learn and who want to create a long-lasting career in this innovative industry.” For application details, please click here .